Google’s aerial photographs of different nooks and crannies of the world have occasionally turned up some peculiar things. One of them is in Chicago. In the Illinois Medical District, on the northwest corner of Ashland and Harrison — the site where Rush University is putting up a new hospital is a life-sized blueprint showing offices, hallways, columns, and stairwells. 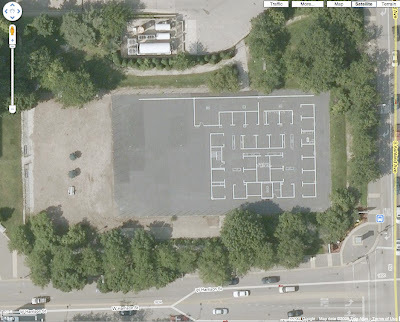 We don’t know if this was for a training exercise, or for actually laying out the real building. But it’s still a local curiosity revealed by the all-seeing eye of the Google bird.